Barry Schiller, a retired Rhode Island College math professor, is a long-time member of the State Planning Council’s Transportation Advisory Committee. He also was on the RIPTA Board of Directors 1995-1999. Here is a chance to give your opinion on any railroad related issue in Rhode Island. In response to Federal incentives, RI is developing a State Rail Plan for both passenger and freight services. A draft is available on-line at Planning.ri.gov. There will be public hearings on this draft on Thursday, January 23 at 10am and 6:30pm at the Department of Administration Building in Providence. The draft plan starts with state railroad history, explains the process for developing the plan, notes related Federal programs and previous studies, and inventories the existing situation. The plan goes on to identify various desirable goals related to safety, security, infrastructure condition, reliability, service levels, coordination with other agencies, economic activity, congestion reduction, environment, and financial feasibility, but perhaps the heart of it is with Chapter 10 “Rhode Island Rail Investment Program” which suggests implementation plans over a 20 year timeframe. On the rail freight side, the plan notes tonnage almost doubling since 2001, an increase due in part to the investment already made in the Freight Rail Improvement Project that built and upgraded tracks and increased clearances. Further improvements desired include more rail car storage space and a better turnout track from the main line in Quonset, a loop track at the Providence port, safety improvements to allow freight trains to go through Providence Station when passengers are on the platforms, projects that will cost at least $12 million. Long term there is a need to replace at least 5 rail bridges in Massachusetts. There may also be a need for a third track on the 2-track section of the Amtrak northeast corridor north of Kingston where capacity is limited due to the increasing needs of intercity, commuter, and freight rail. On the rail passenger side, it notes Amtrak riders using Rhode Island train stations a year are up 65% since 2003. 510,000 riders/year use Providence Station for MBTA commuter trains, up from less than 200,000 in 2003. Another 71,000 used the new commuter stations in Wickford Jct and TF Green last year. Improvements at Providence Station and Kingston are underway but there is a long wish list for other projects. These generally first require studies or preliminary engineering. With high priority suggested, these include further Providence Station improvements, the third track, an Amtrak stop in Warwick, the Providence “streetcar,” and higher vertical clearances on the lines between our ports and the national freight rail network. Actually recommended for construction: improvements to the Pawtucket MBTA layover facility, to the tracks at our ports, and some East Bay rail crossings. Also on the wish list with low priority: passenger service to the Blackstone Valley and on Aquidneck Island. In my judgment, too little attention was given to electrification of MBTA commuter service, infill stations other than Pawtucket and extension of commuter rail southward, coordination of Amtrak-MBTA-RIPTA fare cards into a version of the EZ Pass, and any vision of a streetcar network beyond the 2 mile “core connector” starter line. There were some very modest performance goals, for example calling for only a 1% annual increase in commuter ridership. Any serious rail improvement with their economic and environmental benefits will depend on funding availability, prospects for which I think are dimming as with the rise of the tea-party types, emphasis shifts to deficit reduction and personal spending rather than community investment. Railroading, and Amtrak in particular, with its highly unionized work-force and energy efficiency potential, can be a special target of these right-wing groups. That last part – coordination of the various passes into one regional standard pass valid on all services. For example, were I to buy a Charlic Card for the commuter rail service it should be valid on all RIPTA vehicles. What this would essentially do is fold RIPTA into the MBTA. Fare integration need not fold RIPTA into the MBTA, they’d remain independent. NYC MetroCards work on PATH trains and those agencies remain independent. Also, Charlie Cards currently work on the Worcester and Cape Cod transit systems and those agencies remain independent of the MBTA. There’s technological and accounting challenges, but it is doable. Currently, RIPTA’s fareboxes don’t play well with Charlie Cards. I believe there is some discussion of barcode technologies maybe making them play together. It might end up with RIPTA cards only working on Commuter Rail for now. It’s nice that the rivers were uncovered, but what a lose of infrastructure. 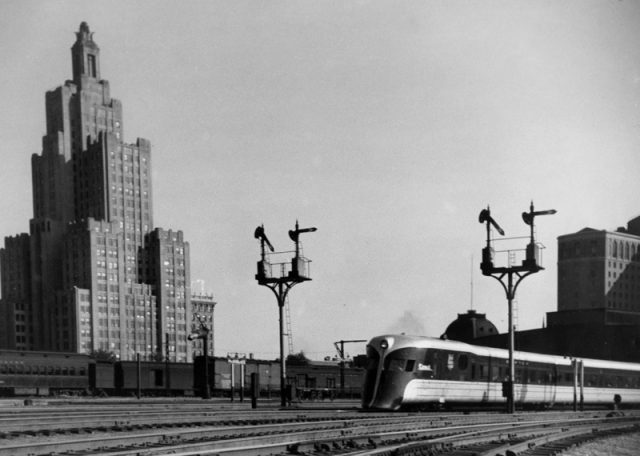 The platforms and underground access of the old station was similar to what New Haven still has today. Before the old station closed only a platform next to the station and half of one of the nearest center platforms was used. Does anyone remember how many center platforms and tracks the old Union Station had? Fare integration would be a game-changer, and should absolutely happen – but there’s no reason to spend even more money on garbage hypothetical technology like a ‘transit EZ Pass’ when fare integration is easy to implement on the organizational level. Just instruct Providence Line conductors to start accepting RIPTA transfers and passes as valid payment for one-way travel between any two RI stations, or any RI station and South Attleboro once RIPTA starts running across state lines. Instruct RIPTA bus drivers to ‘wave on’ anyone who presents a valid commuter rail pass, no farebox interaction required. Cost of the technology to make this work? $0. If the MBTA is willing to admit that they’ve completely dropped the ball with regards to the Charlie Card and the ‘mTicket’ app, and demonstrate any desire whatsoever to make good on their broken promises, I’d be far more supportive of switching RIPTA over to the Charlie Card system or figuring out how to successfully merge the two systems. Not before. Heavens to Betsy, tell us how you really feel. The German transit planning nostrum, “organization before electronics before concrete,” was coined for exactly this kind of thing. Fare integration is well within the realm of organization, and pursuing the technological solution of a ‘transit EZ Pass’ meant to integrate two (and if you want to add Amtrak, three) apparently mutually-exclusive electronic fare collection media when one of the component systems is already being operated in an incomplete and broken state and another of the component systems isn’t even remotely close to the level of adoption it would need to be at to justify ‘integration’ over ‘planned phase-out’ makes absolutely no sense when the $0 pure-organization solution of hand-collecting paper transfers does the job just as well but costs us nothing and can go into effect (figuratively) tomorrow. That’s why the transit EZ pass is garbage technology. It’s a product born of the exact kind of ‘wouldn’t it be cool if…’ mentality that is appropriate for start-ups and think tanks, not public services. There’s simply no good reason to pursue it at this stage. If RIPTA’s tap technology was in use by the overwhelming majority of current and potential riders, if Charlie Card actually worked on the commuter rail, if methods for integrating fare media in the fashion were already well-tested and well-implemented by agencies around the world (never mind around the country), I’d likely have a very different attitude about the concept. Under the current set of circumstances? It’s a terrible idea, no matter how ‘cool’ it might be to have. That having been said, the MBTA adopting the official stance of ‘this was never the plan, disregard all the times that we told you that this was, in fact, the plan, we’re liars’ certainly didn’t do anything to endear me to the concept of introducing more experimental technology. wow, I hadn’t realized the EZ pass would be so problematic, especially as the concept seems to work for diverse toll authories. Barry – could you tell me (us) how European trains are financed and coordinated across national boundaries — managing to get to every medium-sized place throughout some 17 counties – with time-tables suitable for every (most) purpose (s) – night and day, winter and summer – and occasionally at Tres Grande Vitesse. Why can’t we? What about an RI-Rail Pass (or better yet a Yankee-Rail Pass) that could accommodate us all as well as the Eurail Pass has done these many years. Barry, the problems start when you introduce differing standards of technology. EZ Pass is a great example of many regional agencies cooperating, but it is still one system and one standard, adopted by many users. Once you pass Virginia heading south, however, EZ Pass becomes a lot less useful – because Florida and North Carolina both use competing standards (Sun Pass and Quick Pass), and – much like the Charlie tap technology and RIPTA’s nascent tap technology, EZ Pass and Sun Pass are mutually exclusive standards. SunPasses can’t be read by EZ Pass toll collectors, nor can SunPass receivers read EZ Pass transponders. Quick Pass is in the process of working out agreements to merge its standard into both SunPass and EZ Pass in such a way that QuickPass can be read by either collector, and from there, minor tweaking will finally marry SunPass into the ever-growing EZ Pass district. That’s still going to take three years, and all the technologies involved are mature and well-patronized systems that have had most of the errors worked out. Meanwhile, the MBTA continues to play with half of a deck, fast and loose, and kindly asks its patrons to pay no attention to the broken promises swept under the rug. RIPTA made a critical tactical mistake in going with a differing standard, but it’s a mistake we’re now going to have to live with because it’s not quite as simple as just adjusting the radio frequencies until the tap technology in use on RIPTA buses today is broadcasting and receiving on a CharlieCard frequency. Meanwhile, as I’ve suggested before and will continue to suggest – even if we want to be in the tech start up venture capital business of being first out of the gate for what might be the new standard of transit fare collection some day (and I’d really rather we were the second state/region/agency to have these new technologies – let somebody else experiment and suffer through the growing pains), the fact remains that we can instruct personnel to cross-honor passes and hand-collect paper tickets (Amtrak actually does this with the SEAT bus to Foxwoods in New London – if you buy Amtrak carriage to Foxwoods Casino, you get an Amtrak ticket that the SEAT bus driver will collect) and have that in place right now while we wait and suffer through the false starts and faulty releases of technology that’s garbage today and two years away from being worth full implementation on any rational time frame. The MBTA made a huge mistake releasing the mTicket app as an incomplete product, and then they doubled down on their mistake by lying about it. We have no guarantee that doesn’t happen to us again if we rush headlong into trying to create a transit EZ pass. Merry Christmas, by the way, everyone! I hope you’re all having a wonderful holiday season thus far. Is there any chance of getting rail between Woonsocket (or Worcester) and Providence? And what about Newport? And Kingston seems like the really low-hanging fruit. I almost wish they’d just bypass Wickford Station, because that was a waste, but getting to Kingston with rail would mean students could connect from campus to Providence without the 66, freeing that route to be a shorter, regional, Narragansett-Wakefield-Peacedale-URI bus. When I lived in Kingston, the worst thing was the possibility that my bike might break, and it would be out of the range of bus service, or during a period where the bus only comes every two hours. Having half-hour service in that area would really make that better. We could do that if we shortened the route. URI’s got a huge problem with expanding parking, which has been covered over and over by Eco RI. We seem to want to fix the problem by subsidizing farmland to keep it from being bought for parking. Why not 1) Ban universities from spending on parking (let some other agency develop it privately, as a separate service) and 2) put the parking and farm land money to developing the rail project, connecting loose ends on the bike path system, and making 138 crossings easier around the campus. Which is never, ever, ever going to happen. I’ll tell you why it’s never going to happen: there are exactly zero ROWs left intact (never mind available) that go to Newport from anywhere useful. The better of the two good ROWs that once existed for rail between Providence and Newport is now a ‘beloved’ bike path (read: salted earth) through Bristol County, and the bridge that would have otherwise connected the bike path to the existing ROW on Aquidneck Island is gone. Actually, it’s a good thing that bypassing Wickford Junction won’t be required – because the only thing that could be worse for the future of rail travel in this state than actually building Wickford Junction was would be to have to abandon Wickford Junction. We’re well and truly stuck with it – having to admit what a terrible decision it was to build sets every other rail project in the state back 20 years. Even when commuter rail comes to Kingston, I don’t believe that completely truncating the 66 is a good idea. RIPTA has at least claimed that they’re going to start running it every 30 minutes between URI and Providence during weekdays (every 60 minutes between Galilee and Providence) – and if they have the resources to do that, they have the resources to run buses every 30 minutes between Galilee and Warwick and every 60 minutes between Galilee and Providence. Structuring the route that way instead provides a sufficient level of service to the route south of URI without shortchanging anyone trying to get to points north of URI that aren’t downtown Providence or the Airport; even better if RIPTA re-aligns the 66 to operate over Route 2 the entire way into Warwick instead of bypassing EG and parts of West Warwick by going over 4-95-295 instead. The 66 northbound hits very few useful places before Providence. Really only CCRI, and because that’s on a hilltop and in a non walkable area, that requires a long detour. The other two major stops are park & rides (one a quarter mile frim Wickford Junction!). The route should be truncated. In order to make a route useful for shopping, etc and to reduce non peak driving, frequency ought to be at 15 mins or better. Kingston has all these nice walkable villages near it, a huge university, and a bike path, but unless you’re nuts like me you won’t abandon a car because the risks if you have horrible weather or a flat are too great. More and more I’m overcoming the adolescent urge to rage at others for not dping the self/denying things I do, and beginning to understand the why of our car culture. RIPTA’s committed to sending it to the Warwick Mall as well. Truncating it there will provide South County residents access to Warwick in a way that the train won’t or can’t (I was also told that connecting the Warwick Mall to the Interlink just couldn’t be done). The Route 102 Park and Ride is awful, but RIDOT is at least as culpable as RIPTA is for the life-threatening state of that intersection – which features no pedestrian traffic light phase and no crosswalks. You are very clearly not meant to cross there, and are risking your own life if you do; fixing that would go a long way even if we just can’t run buses the extra 1/4 mile into Wickford Junction proper. Routing it over Route 2 lets it hit NEIT/East Greenwich Square, Cowesett Corners (losing its bus service because of restructuring to the 29), Bald Hill Road (now to be served by the 29, which probably isn’t the best use of that bus) turns CCRI from a huge detour into a very small detour, and carries a minimal to non-existent increase in trip time penalty over the current primarily-freeway routing. All of those people, by the way, still benefit from having it run the rest of the way to Providence half the time because they’re too far away from either Kingston or Wickford to avail themselves of the train option. The route doesn’t really need to be truncated. It needs to be adjusted. The bigger point about the Kingston rail-bus service plans is to what extent enhanced rail service can replace bus service. There is a provision in Federal law that essentially prevents layoffs of any bus employees in that situation, so the bus service would presumably have to be redirected. All this is one reason on the rail front I’d suggest concentrating for now on improving utilization of existing services and seeking infill stations which might be done relatively relatively cheaply if we keep them simple as the trains are going by anyway. I think I’m against mall service. We should focus our bus service on places that are built fir buses. By the way, I saw the ‘F the suburbs/don’t F the suburbs debate in one of the recent threads–I think the bus hub one. I’m not saying that. There are lots of places all over the state that could be well served by transit that aren’t cities. Mall developments are not them. I’ve been getting a lot of flack from liberal relatives for becoming a fiscal conservative. This is kind of odd, because I think my opinion is largely Eat the Rich. But there is a role for market oriented thinking within this. How will people get to the mall/Walmart etc. w/o the bus? I guess they’ll drive. Or they’ll shop elsewhere. The point is, with or without expansion of funds, we have to think about where the funds will have the biggest impact on ridership, climate, etc. A poor person (I’m frankly pretty poor) struggles to shop at small stores, but that’s because every facet of policy subsidizes the Walmarts of the world. Redirecting resources to create high frequency/high span bus service in walkable areas will stimulate growth along routes, give access o the poor and disabled, and be one nail in the coffin of the unsustainable adventure of malls. It’s the natural market outcome, and we should stop fighting it. Let macroecomic tax policy, education, healthcare, or other policy areas be the aid to working people. Don’t create buses to nowhere to do it. Regarding Barry’s comment on layoffs, I certainly wouldn’t want those. My point is to use the labor time we have to bring as much 15 minute or better frequency to routes. Take whatever savings from cutting unised routes and apply that to expanding others. I think being against mall service is extremely short sighted. We may not all like the building pattern of malls, especially malls built in a floodplain, but we cannot in the immediate future change the nature of our retail landscape. Warwick Mall provides a single stop where people without cars can access an array of retail options, including not un-importantly, groceries at Target. In order to match that in the suburbs one would have to take a bus (likely buses) to many different retail strips and spend hours or days reaching destinations one can reach in one stop at the Warwick Mall. Warwick Mall is also an employment center for largely low-wage jobs, jobs taken by people who may not have access to an automobile. Like it or not, Warwick Mall is Warwick’s downtown and focusing bus transportation there makes sense for the current physical layout of that city and the needs of people who live there. The State should actually get the mall to build a suitable station there for transfers and layovers and the shoppers and workers using buses to get to the mall. Current bus accommodations there are little more than a muddy shame-hole in a corner of the parking lot. I think you make a lot of valid points, Jef. Maybe I would modify what I said to say that I don’t necessarily think having bus access to the mall is a bad idea in the short run, but that perhaps it should be of a different kind. If you think about what a low wage person has to do at one of these jobs (and believe, i take these kinds of work, so I know) having that bus may be a lifeline, but it’s a crappy one. You can’t run convenient service that way. What might make more sense, and would help support the train, would be to run some kind of short, frequent bus within Warwick that goes between things like the mall and the airport train station, so that people can come from a variety of places all over the state to work or shop. A short bus, especially if it was given a right of way (which lord knows there’s room for on those giant roads) could give 10 minute frequent access back and forth. It could get land use to be more walkable in Warwick, etc. Much better than the 66 current route. The park and rides are useless. Like it or not, Warwick Mall is Warwick’s downtown and focusing bus transportation there makes sense for the current physical layout of that city and the needs of people who live there. True enough, but here is a much larger issue than “Should the bus line serve the mall?” Now is as good a time as any to try to undo all the transportation policies, zoning policies, tax treaties and lack of efforts to limit consolidation and predation in the retail sector that have given us a world where most people, even in so called walkable neighborhoods, rightly feel that their shopping options are unacceptably limited if they do not have a car. Food is the big one. Policies to make sure that every walkable neighborhood features shops with fresh and not overpriced food would interest more families in going car-free than all the other transit and parking policy tweaks we talk about here. RIPTA has at least said that they are going to be constructing a real bus station at the mall, alongside some of the reconfigurations brought about by the COA to emphasize Warwick Mall, including diverting the 66 to serve it (which, again, creates the bizarre situation where there’s no direct access between Bald Hill Road and the mall, both are served by buses with awkward service patterns, and there’s really no good reason not to adjust the 66 to follow Route 2 from 138 all the way to Warwick Mall at this point). The idea of RIPTA accepting a zone 8, 9, or 10 pass as well as MBTA accepting a RIPTA pass for intra-RI and/or a 3 zone ride on the train is a great one and I can tell you that this has already been mentioned to both RIDOT and RIPTA. A very similar and perhaps more streamlined idea (still with little cost) would be to create a new “pass” that can be purchased that gets you all RIPTA services and a 3 zone ride that at least touches RI at 1 point. RIPTA and the T could split the revenue of these passes – my idea for pricing is 50% of the RIPTA pass + 50% of the MBTA pass. Passes could be purchased in increments of: monthly, weekly, 10 ride, or daily. Easy, simple, no computer software needed, simple training for drivers and conductors, and both agencies get revenue and enjoy a new found population that can piece together there needs with both rail and bus. This would seemingly be able to be implemented in a couple months time. Regarding the 66, what would sweeten the deal and make the whole idea of passing through Warwick more acceptable would be to give the bus a right of way. Route 2/Bald Hill Road is very wide, and businesses and residents alike would benefit from this. Otherwise I see this as a diversion through traffic. Even so, I still have to say that ultimately, I feel as though having a bus that essentially reproduces the train stops is bad for the train, but doesn’t create a service that’s good as a bus either. It would seem better to me to have a series of intersecting short buses to meet the train stations and create connections, but Rhode Island’s development pattern is mostly against the water, so I don’t know if there’s not enough of a string of things to go to on east-west routes that would make it worth it. Agree about food! Very important issue. The last chapter in the report is Chapter 9 “Implementation Program.” There is no Chapter 10 “Rhode Island Rail Investment Program,” either in the Table of Contents or in the body of the report, as you had noted at the beginning of this post. Could you please post the missing chapter or provide another link that would have the correct version of the Rhode Island State Rail Plan 2014 report? Chapter 10 may have been condensed into Chapter 9, which has a Table 9-2: Short Range Investment Program. Barry could you check to see if this chart has the same information as what you were referring to in the post as Chapter 10. Without attacking your general point, I just took an Acela for the first time the other dau (didn’t seem that fast to me). One of the few places where it goes relatively fast is Rhode Island, in part because of the superior construction of the Canton Viaduct, and in part because it doesn’t try to stop everywhere. Having more stops in Warwick in general might be fine, but it would probably tend to make the service less ‘high speed’. In general, I feel like speed is overrated as a value. Frequency, like you said, is more important, because the most annoying wait time is on the playform, not traveling. But that should be taken into account. I kind of think the Acela should do one stop in Boston (there are two or three I think) one in PVD, and then go straight to New York, if it’s supposed to be high speed. Through CT, the Acela deals with grade crossings that New London County refuses to allow to be closed, and west of New Haven, is dispatched by an agency that simplifies its own job by forcing all trains to run at the same speed. West of New York, it runs at pretty good speed – it can reach 135 mph out that way – but there’s nowhere that it hits its full speed as far as I’m aware. Still, even if it isn’t necessarily the fastest train, it is sure comfortable. I like it. It has to stop at Back Bay. Well, technically speaking, it doesn’t have to stop there, but the speed restrictions on the Back Bay Curve essentially make it pointless to pass through Back Bay at speed. Same deal with Providence. Route 128 it can (and really should) be bypassing as a stop at least some of the time, but Amtrak has for whatever reason declared that stop to be a priority for them. Only one Acela going south and two going north stop at New London, which I believe was part of a concession that allowed Amtrak to run more of its own trains than bridge crossing agreements would have allowed. I don’t know if we’ve gotten to the point where that concession is now longer needed, but for one and a half round trips a day, I don’t think it’s that much of a problem. Trains should also be skipping one of New Haven or Stamford, but only one. Good luck convincing Connecticut to allow high-speed trains to express through their state without ever stopping – and really, there’s no point to not stopping once. Of course, not stopping twice might shave some time off the trip. you’re right that Chapter 10 (in the October draft I was working from) has been folded into Chapter 9, it is the “investment program,” a list of prioritized recommended projects short and long term, some cost estimates. The only change I noted from the October draft is a downgrading of the Providence streetcar short-term from “final engineering design” $7 million to “preliminary engineering/environmental analysis (ongoing)” $2 million, still high priority. I thought this was a good idea to reduce the scope for now as why spend the $$ for final design unless there was a realistic plan for funding its construction and operation. I also will note the performance measure of raising commuter rail ridership was boosted from 1% to 2%. Also more attention was given to passenger amenities at stations. Some of the changes were in response to comments made at the TAC or State Planning Council (elsewhere??) which suggests changes in the draft can really be influenced by comments at the Jan 23 hearings, so please try to come if you have some ideas on this. By the way, one way to get around this that as worked elsewhere is to develop a balanced regional plan with a vision that excites the voters enough to support some kind of new revenue stream, usually a sales tax hike, to fund transportation. I believe this is how Phoenix, Charlotte and maybe one of the Texas light rail systems got built. In contrast I think there is no way RI voters would approve a sales tax increase for as narrow a project as the core connector streetcar. Thats one reason I think we need a larger vision. I agree that developing a “balanced” visionary plan is key, but it must be a Providence Metro based one. The all roads lead to Rome concept. The current paln is far to suburban based. The decisionmakers and populace are not aware that Providence is the 10th most densely populated metro in the nation. But frankly, had the Governor and Rep Langevin supported the Providence streetcar system, it would have recieved the TIGER grant funding. Instead, they pushed a needless rotary in Warwick. Hmmm??? If there had been an actual proposal on the table for a Providence streetcar system, it would have received the TIGER grant funding regardless of the governor’s support. Unfortunately, there’s no proposal on the table for a Providence streetcar system. The proposal that’s actually on the table is for a backdoor giveaway to Brown University and the hospitals disguised as stimulus for the Jewelry District; and even assuming that the Jewelry District is the prime beneficiary of the Core Connector, economic stimulus should never be the key driving force in transit decision making. It is an ancillary benefit, nothing more. Transit should be designed and implemented for people first. The most important goal of transit is enabling people to get to where they want to go without the use of single-occupancy vehicles, and the Core Connector doesn’t even come close to doing that. Let’s not kid ourselves into thinking that the Apponaug Circulator (a bad project for several reasons I’ve outlined under other posts) had anything to do with the rejection of the streetcar, because that’s reading into a narrative that doesn’t exist and provides shelter for the Core Connector from the truth that nobody really seems to want to confront: the streetcar in its present form is just as awful of a project as the Circulator is (for entirely different reasons, mind you), and was never going to receive TIGER funding either way. At this point, it needs to be tabled and revisited in 15 years, as a Phase III extension of streetcars running from Cranston to Pawtucket on Broad and North Main, with a spur out to Olneyville via Broadway and to Fox Point via the East Side Rail Tunnel. At that point, it becomes useful. Before that point? It’s as good as having no streetcar. I will stand by that statement for as long as I need to, because it’s the honest truth. I agree that a much larger citywide or region-wide vision needs to be developed for a streetcar or light-rail system in Providence, which I among others have advocated for some time. I disagree that there was no “actual proposal on the table”—there was. Whether you like that proposal or not is another story. It could take a decade or two or longer to develop another streetcar or light-rail proposal. By the time that happens, it won’t just be the state house lawn covered with parking, but the 195-land and more of downtown, as well as every commercial corridor and multi-family neighborhood in the city. Whether residents are from the city or suburbs, it’s delusional to believe that the bulk of the Rhode Island’s middle-class that currently drives will suddenly start riding the bus. In every American market where streetcar or light rail systems have been built that specific demographic has started to use mass transit that otherwise wouldn’t have. The Governor and by extension RIDOT’s support for the Apponaug roundabout proposal doomed any chance for the Core Connector to win a TIGER grant. The reverberations and negative effects on Rhode Island’s mass transit, including bus and commuter rail, will be felt well into the future with the shelving/rejection of the Core Connector proposal. I’m objecting to the characterization of 2.5 miles of rails embedded in pavement and subject to mixed traffic as a ‘system.’ It isn’t. It’s a single line, and worse yet, it’s a single line that only provisions for an actual system in the broadest of senses, “leaving the door open” for streetcars to maybe one day branch out from the Core Connector. That’s not a proposal for a Providence streetcar system, and it’s only barely – only technically – a proposal for a Providence streetcar. It’s also delusional to believe that the bulk of Rhode Island’s middle-class urban drivers would drive to some garage so they can take a trolley through the Jewelry District to either Brown or the Hospitals when they could, instead, just drive the rest of the .5~2.5 miles. The difference between our singular streetcar proposal and successful examples of new streetcar development elsewhere is absolutely in scope. Scope is the reason those other projects succeed and are succeeding, and lack of scope (lack of vision) is the reason that the Core Connector is already a failed project when the first day of operation is still two years or more away even if President Barack Obama were to touch down at T.F. Green tomorrow morning with a comically over-sized check and a set of ceremonial ground-breaking shovels. I disagree. The Core Connector was doomed from the start – even if our entire delegation in Congress had lined up behind the Governor in support of this thing, we weren’t getting the money. That they chose to back a fundamentally flawed roadworks project in Apponaug was tremendously disappointing, and that enough people in decision-making positions were spun (ha!) into awarding money to the thing is tremendously unfortunate on a number of levels. However, this was never a case of “which of Rhode Island’s two proposals is getting a grant?” Treating it as such is not only a major disservice to the prospects of streetcars in Providence, it’s also a major disservice to Apponaug – we still have a chance to stop the Circulator madness, but only if we can stop treating it and the Core Connector as being inextricably linked. several of us noted need for RIPTA-MBTA coordination and bicycle and bike path access to train stations; Two of us also expressed support for electrification of commuter rail and more generally, regional cooperation. One person, but it was Scott Avedesian, spoke for priority for Warwick including an Amtrak stop there; also drawing one comment: expansion of commuter rail to Kingston; improving tracks in the Port of Providence earlier; promoting bike access on Amtrak; I also suggested more attention to marketing existing service including implementing a state employee incentive to use public transit as has been required by law. I haven’t seen the written comments yet, but that, and an amended verion of the plan incorporating some comments should be on the DOA website before the TAC meeting 2/27 and the State Planning Council, the adopting agency, in March.